I'm really excited to announce something we're going to be trying here at The Essential Herbal! Our first ever on-line class. We're going to be teaching how to make self-igniting incense cones from the powders of herbs, resins, and Sandalwood. There will also be discussion of loose incense, smudge, and safe ways to burn the incense. We are creating a special package of materials - enough to make about 24 cones of 2 different varieties - just for the class ($20, includes registration and shipping), so you can work along with everyone else - or, if you'd rather just "sit in" the registration is only $5. Materials kits will start shipping March 1. Our Yahoo group was telling us how much they wanted some classes, so it seemed like time to give it a try. I've been trying to figure out exactly how to do it so that everyone who wanted to could participate in their own time frame. I once taught a class in a forum set-up, and it didn't feel right - 4 hours spent hitting the refresh key. So, we've "reserved" a Yahoo list just for classes. We'll be able to post lots of pictures, and lots of instruction. The group will be relatively small, so without the intimidation of a large group, questions and answers should be flying. The people on our regular group are a very friendly gang. Even though this is not exclusive to the group, I'm looking forward to being able to jabber in a smaller group about one subject. The class will run from March 12 through March 18. Materials must be ordered by the 7th in order to be delivered in time. Registration with no materials will be open until March 11. On the 10th, we'll send out invitations for the new Yahoo group to those who are registered. That will give everyone time to get there, and if anyone has a problem, we'll have a chance to straighten it out. Want to join us? There is a button at the very top of the left hand navigation bar on our website. Here in PA, the ice storm from last week is still having an effect on travel and the sub-freezing temps are going to hang on for a couple more days. This is the front door of the house. The ice on the roof is a couple of inches thick, and although this door isn't being used (it would require some serious chipping - that isn't snow, it's ice on the ground) I think about how dangerous it would be should it slide off when a door is slammed. I can stand on the surface of the "snow" and not leave so much as a footprint. Very unusual. Yesterday was the first time I *voluntarily* hit the road in the car since the storm. No doubt about it, I am a big chicken. Anyway, the roads are now somewhat clear, with drifts and 4" ice ruts. It looks beautiful out there, though. I took some pictures from the car. First was the horse meadow down the road. They have over a dozen of these gorgeous animals, and they were out having a tough time finding a little grass to munch. They are at quite a distance, and my little Kodak doesn't do the scene justice. This is a little stream called Back Run. I stopped on the bridge to take a picture. Usually there are a couple of horses playing in this meadow, but they weren't out yesterday. The fence around the tree protect it from the horse chewing on the bark. So that's some of the scenery getting to the closest town. The grocery store was an interesting sight. Many of the shelves were bare, and I realized that delivery trucks weren't able to bring in any new shipments last week. They must have been dropping stuff all weekend, because the aisles had piles of boxes all over the place. Considering that many people hadn't been out to shop for a week, it was a bit of a madhouse. Ok. Enough of this stuff. Bring on the SPRING!!! My description of chickweed: The leaves are typically about the size of a pinky fingernail, although in the lushness of spring before they bloom, I've seen them up to an inch long and nearly as wide. Leaves are emerald green and smooth. They grow in sets, across from each other on the stem, and they almost hug the stem at the base of each leaf - not having leaf stems. There are spaces along the stem of about 1 - 1/2" between leaf sets. Shooting out from where the leaves hug the stem, are tiny stems which hold the flowers. These flower stems are almost as thin as horsehair. The flowers are white, about 1/4" across, and each appears to have 10 petals. There are really only 5 though, because each petal is deeply divided. The sepals are longer than the petals. The stem is round, mostly green with a purplish blush sometimes. When you crush it, you can feel the crunchiness of it, but it isn't hollow. Sometimes the stems are a little hairy. The one I am looking at is not. They have a single row of tiny hairs. At each leaf axis, the hair will grow on a different side of the stem, like a spiral. After reaching a height of about 3", the stems grow along the ground, and can be several feet long. Chickweed, bright electric green with those pretty little white star shapedflowers, is one of my all time favorites of the wild edible herbs. Also known as stitchwort or starweed, chickweed is a storehouse of vitamins and minerals including iron, calcium, magnesium, manganese, silicon, zinc, phosphorus, potassium, protein, sodium, copper, carotenes, and vitamins B and C! Frequent consumption of fresh chickweed helps strengthen all systems and rebuild vitality. Some people steam it, like spinach, but I prefer it raw. Chickweed is an excellent nourisher for those recovering from an illness or surgery, those dealing with AIDS or a wasting disease, the anemic and the elderly. Chickweed has great healing, cooling, drawing, and dissolving abilities. Try it when you want to bring a boil or pimple to a head, dry up herpes blisters, clean up an infected wound, or extract a splinter. Applied as a poultice, chickweed stops infection by weakening bacteria cell walls. To use fresh chickweed as a poultice, simply apply the bruised leaves directly, covering the plant matter with a thin layer of gauze or a cabbage leaf. When the plant material gets warm, remove and discard it. Poultice again with fresh chickweed as necessary. When stung by a bee one summer, my son's lower arm swelled to an alarming size and became very hot to the touch. We poulticed with fresh chickweed and within 20 minutes the swelling and heat were considerably diminished, and by morning, completely gone. Infused oil of chickweed helps heal minor skin irritations, diaper rash, fever blisters, and bug bites. Chickweed also has an excellent reputation for aiding those dealing with eye problems including infections, sties, conjunctivitis (pink eye), and tired, sore, inflamed, irritated eyes. Chickweed tincture (25-40 drops, 4 times daily), dependably dissolves ovarian cysts and reduces swollen glands. Many American Indians used it as a remedy against cancer. Chickweed's ability to weaken bacteria, combined with its cooling and expectorant actions, makes an awesome ally for those dealing with bronchial problems, chest colds, pneumonia, or asthma. I cook fresh chickweed in boiling water and use a cup of this broth, or 20-40 drops of tincture, at least twice a day. Chickweed's alkalinizing properties benefit those with chronic infections of the bladder and urinary tract, including chronic cystitis. But it may take20-40 drops of tincture daily for at least three months to correct such problems. Chickweed has been called nature's diet herb. It contains soapy-like substances called saponins which break down fat cells, sometimes with phenomenal results. Chickweed also nourishes and regulates thyroid function and balances the metabolism. Chickweed is a joint-oiler and an excellent choice for those dealing with arthritis, rheumatism, and gout. I find consistent use of the tincture, 20-30 drops three times daily, reduces pain and swelling, inflammation, and itching. Chickweed in the daily diet, eaten fresh by the handful or in salads, helps soothe and heal these conditions, as does the infusion, the tincture, and frequent poultices on the affected area. You don't have to be ill to benefit from chickweed! Nutritive chickweed is a friend to the healthy that want to stay that way. Chickweed is an abundant weed in some gardens. Around our place, it likes shady damp areas with rich soil. You may find it growing in the pot with your houseplants! 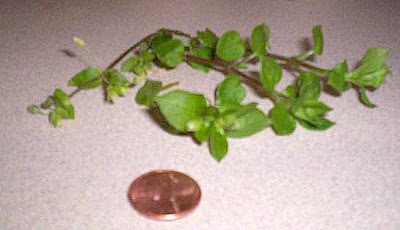 Chickweed has small, light green leaves and sprawling stems. It can be gathered anytime it is green and vibrant, before, during, or after the little, white, star-like flowers show. In the winter you can dig it up from under the snow! Chickweed is an annual, so it makes a lot of seeds -enough to feed the songbirds and self-seed readily.I gather fresh chickweed for salads and use only fresh chickweed for poultices, tinctures, vinegars, or infused oils. Dry chickweed has lost most of its medicinal value. Most days, I truly love this job. Being the editor of The Essential Herbal magazine is a pleasure and a joy. Every now and then, a day comes along that isn't quite as enjoyable. This has been one of those days. The magazine, in conjunction with co-listmom Michele at Possum Creek Herb Farm has a great Yahoo group. Many of our subscribers have joined, as well as Michele's customers, along with some who are just herb enthusiasts and found us. It is mostly women, and we talk about everything under the sun. We both do 99% of our business in North America, so our members are mostly from North America. It is usually close to "on topic", but there's weather, kids, and all of the other things that make up our days, as well. The list helps me come up with some great articles, and it feels like a big group of friends. Overnight, I was bombarded with requests to join from males on another continent. Not a single woman. Considering that just last week my credit card number had to be canceled due to its being hi-jacked somehow in that same continent, I was leery. It seemed prudent to put the newcomers on moderated status. Hah! That was not good enough. New links went up on the home page, and members who posted started getting private emails from these guys. Out they went, links and all. I posted a warning to the group. Am I being narrow-minded and provincial? Maybe. Do I intend to do everything necessary to retain the friendly, trusting integrity of the group? Absolutely. Because here's the thing: we aren't all that interested in quantity. We aren't all that interested in self-proclaimed experts coming to share their genius, thank you very much. We ARE interested in making sure that our customers have a safe, secure place to chat without having to worry about spammers, scammers, and crooks. So if I reacted harshly, those are the breaks. Like I said, some days aren't as pleasant as others. This is a hum-dinger we're having right now. Yesterday was snow all day long. It was fine powder, and although dangerously slick to drive in, it was easily managed with a broom and shovel here at the house. But something eerie happened overnight, and I woke up several times to the sound of tiny ice pellets hurling themselves against the bedroom windows. We are now firmly entrenched in what can only be called a "sleezzard". Sleet coming down in blizzard conditions. I can only imagine the quantity of snow we'd be having if this were fluffy and white instead of compact and hard. The house is rapidly becoming encased in ice. All of the windows are now covered and caked with these ice balls, and I can only see outside through a couple of them. The temperature is supposed to dip sharply as the day progresses, so I think I'll need to find a pick axe to clear the doorway. Maybe I spoke too quickly about the onion snow the other day. This isn't it either. Dang! Update: I was able to get through the 2' ice drift that wedged against the front door, and dug the porch out. It has now changed to snow. I think Jack Nicholson walked by carrying an axe. What's cookin' at Torchsong's studio? It's about time to let the cat out of the bag for the upcoming issue. Here's the cover. Last year one of the women on the list posted a picture of herself in her gardening get-up. It was pretty cute, and she was covered from hat to boot. We thought about that picture and about the snow that sometimes falls during these months, and this is what we came up with. I really like to wait until every single issue has been mailed to subscribers, shops, advertisers, and writers before posting the newest issue of The Essential Herbal. One of the test copies were delivered today, so that means everyone will see them in the next couple of weeks. The cover is even more appropriate than we'd suspected, as (at least here) another storm is headed this way. I did feel bad addressing a copy to Australia, knowing that they are baking there right now. By the way, this is a good time to get those ducks in a row and get your copy of Wild Foods for Every Table (available at the web site) so you'll be ready when the little greenies start popping their heads above the soil. The recipes inside have been submitted by some of the experts in the field, and lots of people who have been quietly foraging all their lives. You can dine freely (and we do mean freely) from the weeds growing all around you - and dine well! These aren't recipes for stack-o-weeds, folks. These are delicious soups, desserts, main dishes, and beverages. There are dips, appetizers, salads, and side dishes too. You won't regret it. Plants and Seeds - where, oh where? I know I'm a big old whiner. It was only a couple of weeks ago I was longing for the winter to get here, but now I'm ready for spring. Enough cold, time for gardens! Plants are easy for me to get! Michele at Possum Creek has great plants, and Kathy of Cloverleaf Herb Farm is right over the hill. Besides that, Landis Valley Herb Faire is just a few days before our "safe to plant" date here - May 15. Seeds, on the other hand, are something I'm just now having the space to work with. Before, it seemed better to just buy 2 or 3 plants of the ones I've wanted. Lavender, rosemary, and basil will stay that way, along with some of the more unusual ones, but now I can have ROWS of great veggies for the table, and fragrant herbs for the still. I'll be ordering catalogs today. Hope it isn't too late to get the varieties I'll want. 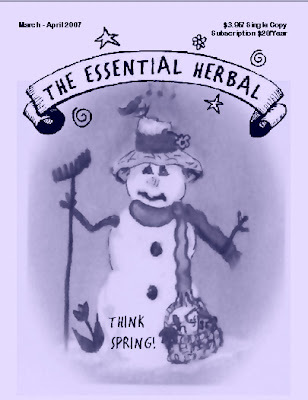 Around here at The Essential Herbal, we usually think of February and March as "the dead" of winter. In the past, that has been the case. The Mar/Apr issue is all but out the door, and there isn't a festival or plant sale for months. So that would normally mean lots of reading, cleaning the house, and winter snoozes. This year that doesn't seem to be happening. It started out several months ago, when Sarah Liberta asked if we'd come down and do an herb program in Baton Rouge in the beginning of May. I've been promising Sarah for (literally) years, so decided this was the year. It should be lots of fun, and I'll post more details as the time approaches. Then of course we wound up taking part in the Farm Show. That seriously cut into our down time, right from the git go. Little by little, the calendar is starting to fill up. There's a wholesale presentation on the 11th. A one-day trip to NYC on the 15th. 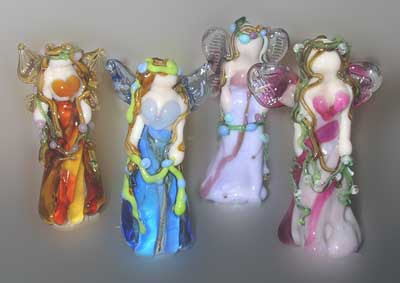 On the 21st, we're going to try a daytime class - incense making - at Radiance (717-290-1517 to register) at 1 pm. I've never done one in the daytime, so it should be interesting. There are already some sign ups, so if you're in the area, it is $12 and you'll get to take home some cones that you've made yourself from powders of wood, resin, and botanicals. March looks deceptively empty, but I know that is the month that wholesale orders start to pelt my sister's soap business. We'll be up to our elbows with shrinkwrap, packing materials, and boxes. Right now it seems that everyone on the Yahoo list is reading (or re-reading) the Outlander series. I've just begun the first book, but everytime I settle in to read my eyes fall shut. Last week we were yakking about chickweed. It made me remember the 8 ounces of tincture I made up last year, and since I've gotten seriously involved in getting in shape for the coming gardening season. So, that's part of the plan. Let's see if it helps, shall we? In each issue of The Essential Herbal magazine, we put together an herbal crossword puzzle. Occasionally we slip in a Word Scramble, or a Word Search, but usually it is a crossword. The herbal word puzzles are usually linked to the season, or like the one below, may be specific to a particular interest. We like to think that there are groups out there using them in their herb meetings, bus trips, and including them in various hand-outs (with proper credit given, of course). The layout of this blog doesn't allow for the size needed for a crossword, so a Word Scramble will be offered. If you're looking for something like this for your herb gathering, email me. You must give credit to The Essential Herbal magazine, but otherwise, it is free to use. The answers will be posted in the comments section. Last night we got about an inch of snow. Since a cold front was headed in (and seems to have arrived), I'm hoping it is enough to give the plants outside a little bit of insulation. I remember as a child, being perplexed about citrus growers spraying water over developing fruit to protect them from a cold snap - until someone explained that it kept them at 32 degrees, protecting them somewhat from colder temperatures in the short term. When I woke up in the silent house this morning, it suddenly dawned on me that the snow changed the way the house feels. There is a different smell. Fresh, clean, and crisp. Is that possible? I've always known the smell of rain, but is it possible that there is a smell of snow? It made me think back to other times when there was a LOT of snow. Yes! I think there is a scent to snow. Not just wet clothes and hot chocolate, not the smell of fear-of-driving-in-that-stuff, but a real, pure scent. The quality of light is different too. Walking through the dining room at dawn, the light filtered in through the windows and if I hadn't already known it had snowed, I think just the difference in the light would have told me. It was good to have a bit of winter. Molly and I had to go somewhere while it was snowing last evening, and we joked about this being the "onion snow". The onion snow is the last bit of snow for a season that signals when it is time to put in the onion sets. We were only half kidding. The groundhog said winter is over.